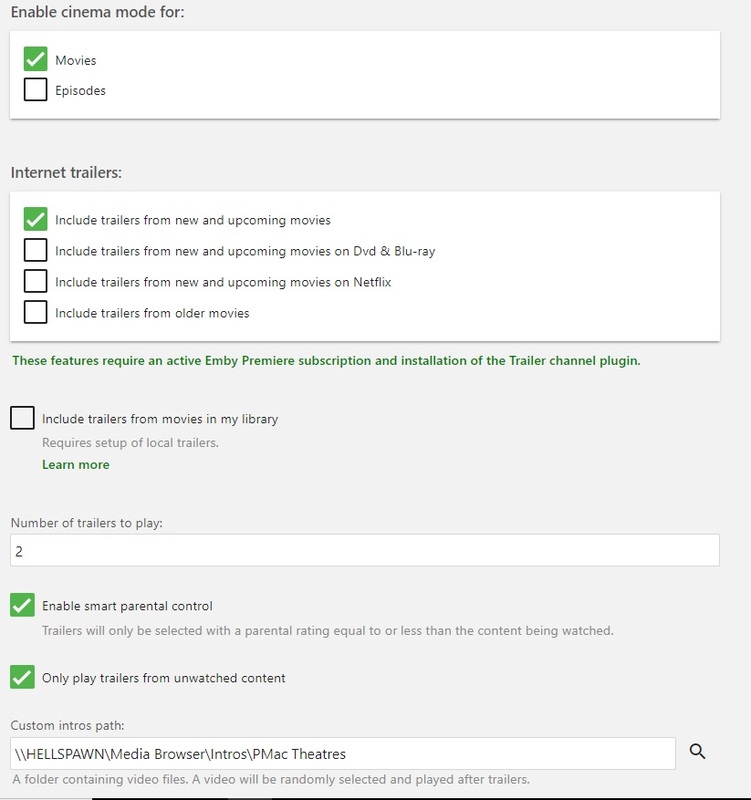 with cinema mode on in the web client most trailers fail to play due to "no compatible streams". emby skips on to play the custom intro and the movie. @Luke, I'm also having an issue with cinema mode where my custom intro plays, but no trailers are playing (I have it set up to play 2 internet trailers before my custom intro). I'm not getting any errors though, and nothing stuck out to my (untrained) eye in the server log. I've attached the log anyway though. Also, I currently have v1.1.2.0 of the Trailers plugin installed. I've tried unchecking all the filters, as well as checking all the different sources, it doesn't seem to change anything, no matter which boxes are checked/unchecked. Trailers play fine from the channel in ET and the web app, just not in Cinema mode (regardless of which app I'm using). Remember that it also has to be enabled in the app that you're using it from. I am also having the same issues as pmac except I'm using archlinux. I'm usually pretty good at diagnosing this stuff myself however I am left scratching my head. I have 3 logs and a screenshot attached to this. I see where my intro stops playing but then it just goes right into playing the movie. Edited by kendoman96, 19 July 2018 - 02:12 PM. Hi, please update to Emby Server 3.5, run a library scan, and then let's re-evaluate. thanks ! Has emby 3.5.x been released for archlinux? Pacman is only seeing "Packages (1) emby-server-3.4.1.0-1"
yaourt sees the beta 3.6.x but I'd rather not run a beta version for stability reasons. It should be, yes. @alucryd can confirm. Thanks. Do you need trailer plugin for the cinema mode plugin to work? Or will the Cinema plugin just stream trailers from youtube before the movie starts? So far I haven't been able to get it to work either just yet. Tried without the 2 filters, now I have the parental filter back on. Either way, same problem, movie just starts without trailers. No custom intro so that isn't the problem either. Yes you need the trailer plugin. Thanks. I too am having the same issue -- trailers do not play before my "main feature". Cinema mode worked fine before I upgraded to v 4.x. Now it does not work. I have tried un-installing and re-installing both the the "Trailers" plugin and the "Cinema Mode" plugin to no avail. My custom intros seem to be working (although the selection always seems to be the same custom trailer rather than selecting one at random). I haven't really looked through the logs too much as they are quite large. If anyone can tell me what to look for, I can grep for that. Edited by jdotero, 13 February 2019 - 11:14 PM. There are several topics on this and it is being looked into. I totally forgot I posted here a while ago. Was before the big server update though. Fixed itself after a week, maybe 2 weeks (server update perhaps?). Wasn't paying attention to it since the feature doesn't add too much of interest for me (disabled on my own account currently). Also have no specifics so the information is probably not of much use. PS: rebooting emby, or server didn't help with it, that much I do know. Edited by miniliQuid, 14 February 2019 - 12:05 PM. Edited by abescalamis, 20 February 2019 - 02:37 PM. This is happening for me also, version 4.0.2.0. I recall there was an issue with the newest version of ffmpeg so I'm still running 4.0.2-7. Should we update to 4.1.1-1?